Horta is the main town on the island of Faial in the Azores which is located directly west of Spain. Only 21km long and 14km wide, it has survived two major volcanic eruptions over the centuries that left behind a fascinating landscape. Known for its lovely sunny weather, it is also called ‘the Blue Island’ because many of its houses are painted different shades of blue. What charms all those who visit are its quiet, sandy beaches, the beautiful hydrangeas contrasting against the landscape and houses, as well as the spectacle of sailing boats from all over the world coming into port. 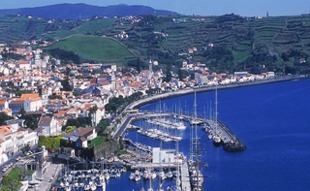 Faial has a very colourful history. It is believed the first inhabitant was a recluse who wanted to escape society, but slowly others began to follow. Josse Van Heurter was one such person, who arrived in the late 1400’s to prospect for tin and silver. Despite the disappointment of discovering there was no money to be made prospecting, he was very excited by how fertile the island was and brought over settlers to cultivate it. Today agriculture remains one of Faial’s main industries. The island was subjected to many invasions during the 16th century by the Spanish and British buccaneers, suffering a great deal of damage. But nothing compared to the devastation that took place after the giant volcanic eruption in 1672. Three hundred years later another massive eruption took place in 1957 about 1km out at sea. The lava actually formed an islet, which is a small landmass made of rock, that became connected to the island by an isthmus, or thin strip of land. One of the main attractions on Faial is Ponta dos Capilinhos, where you can see the houses and land buried during the eruption. This is also where the old lighthouse stands. Horta became a major seaport in the 19th century as cargo ships and yachts started using it as a stopover before embarking on their transatlantic crossing. In fact the sea wall is covered with artwork and messages left by all those who have passed through the port. The town has a very interesting museum, that not only has an exhibit dedicated to the eruption in 1957, but also a fascinating collection of objects carved from fig kernels. The Scrimshaw museum has an equally intriguing collection of pieces carved from whale tooth and jawbone. The island attracts so many visitors, Horta's National Monument, a 16th century fortress, has now been converted into a luxury Pousada. The Pousada da Horta (Hotel Santa Cruz Acores) has fabulous views of the harbour and Pico Island, which is quite a stunning backdrop at sunrise. There are several Nature Reserves on Faial which are worth exploring. The Vale of Flamengos is a particularly picturesque area as well, with lots of flowers and pretty, little houses. As there is a good bus system on the island, it is quite easy to get about without a car. On the reserves you can climb to the top of an extinct crater, one being the Caldeira do Faial which is 2km in diameter and 400m deep. This is where you will also see the laurisilva forest, the island’s original vegetation. 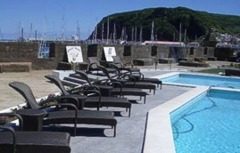 The walk is extremely beautiful with spectacular views of Horta and the other islands. The Cabeco Gordo crater is over 1,000m high and is located in the centre of the island. This too has amazing views of the other islands. If you head for Lajinha and Ponta Furada along the coast, you will find a spot where the sea crashes into rather strange looking lava arches. With regular ferries to the islands of Pico and Sao Jorge, it might be rather fun to go island hopping as well. However, for a really special experience, there are also fishing charters specialising in giant Blue Marlin, and opportunities to go whale or dolphin watching.